Hood racks allow the most effective use of space possible for storing hoods, fenders and other large, bulky items that need protection and easy-access storage. 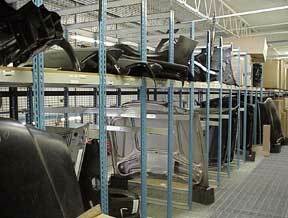 An efficient rack system protects valuable inventory from dents and scratches through the use of good storage practices. We configure your rack system for the exact mission, so you get the best use of precious space that's possible. 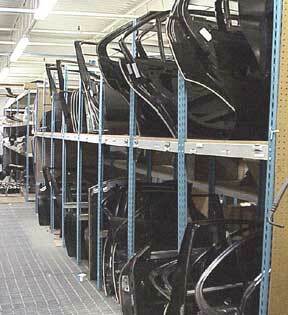 Racks can also be used to hold other large bulk items where damage is a concern. Cisco-Eagle often aids dealers in creating exactly the right storage rack systems to hold items like doors, hoods, sheets, fenders, and other sheet metal storage applications. These racks protect and organize large sheet metal items.